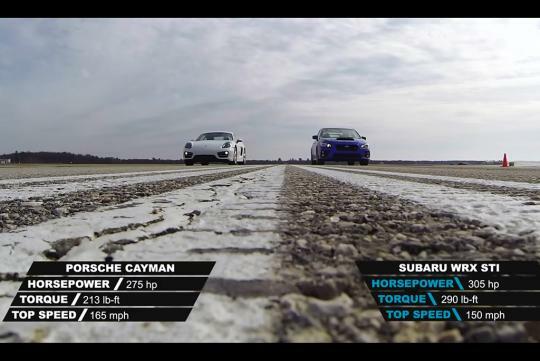 > Cayman vs WRX STI. Who will be faster in a straight line? 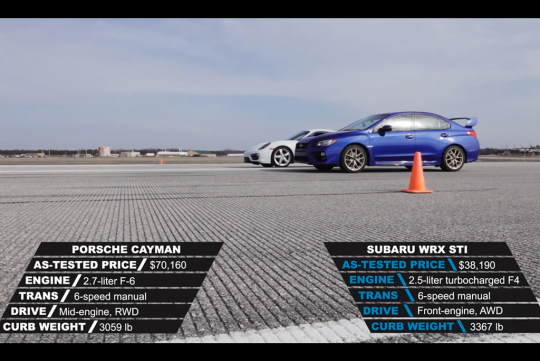 Watch the Porsche Cayman and Subaru WRX STI try to outdrag each other on an empty runway. They might not be direct rivals, but they are currently one of the better performance cars out there. Interestingly, both have Boxer engines and use six-speed manuals but the similarity ends there. Even though the WRX STI is 130kg heavier than the Cayman, it has all-wheel drive and 30bhp more. So who do you think will be the faster car? So its a question with no right or wrong answer, since the WRX was quicker to 60, quicker on the quarter mile, standing mile being a dead heat, and the Porsche having the higher V-max. This show N/A engine needs a longer distance to win. The last one is irrelevant in almost every setting, except (for instance) on the Autobahn (in which case, there are many *much* faster cars anyway). So as far as "real life" usable performance goes, the Rex takes it. Most important is most of us can only afford the Rex so yah, thank God. The Cayman has lesser drag and lower weight... That's why it slowly catches up. So the STI has superior traction and low end torque. But the Porsche has better aero, power to weight ratio and gearing. Close matchup for a mile, but the STI dominates the street light race. You can really see the point where the superior aerodynamics of the Porsche takes over. It'd be interesting to see if the Subaru would have kept its lead if it had a more sensible wing. I imagine it's providing a fair amount of drag at those speeds. It would also be interesting to see whether a Cayman S (with a more comparable HP rating) would beat the STI. One big feature of the STi for its buyers compared to the Porsche is probably something off-video. For a couple of thousand bucks, you can bang over a hundred hp to the stock rating. Something the Porsche can't do.